At AlwaysFreshFish.com we purchase our Mahi-Mahi thru our worldly contacts. Mahi-Mahi, being a warm water fish can be caught throughout most of the world's warmer open seas. Our imported fish is flown into local airports where our refrigerated trucks pickup the fresh fish. AlwaysFreshFish.com also prides itself in purchasing as much local Mahi-Mahi as is available throughout the Southern Atlantic and Gulf States. Fresh Mahi-Mahi is a very popular fish among chefs and is highly sought after. 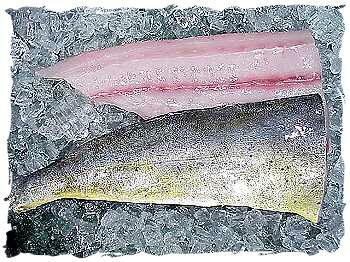 Fresh Mahi-Mahi fillets have grayish to pinkish meat, which lightens when cooked. Fresh Mahi-Mahi meat is firm with a large flake and a mild, sweet flavor. Mahi-Mahi fillets are usually sold with the skin on, partly because of it's beauty and partly because the meat will flake apart in cooking. 1 lb. Fresh Mahi Mahi + 4 lbs. Add. Selections = 5 lb. Total Order OK! Rinse Mahi Mahi fillets under cold water and let drain. Brush grate with oil. Preheat grill on medium to high heat. In a bowl, combine oil, lemon juice, and pepper. Mix well. and cook app. 8 minutes. Turn fillets over and baste again. Cook for an additional 8 minutes or until fish flakes easily with a fork. For additional information on Fresh Mahi Mahi, please e-mail AlwaysFreshFish.com.